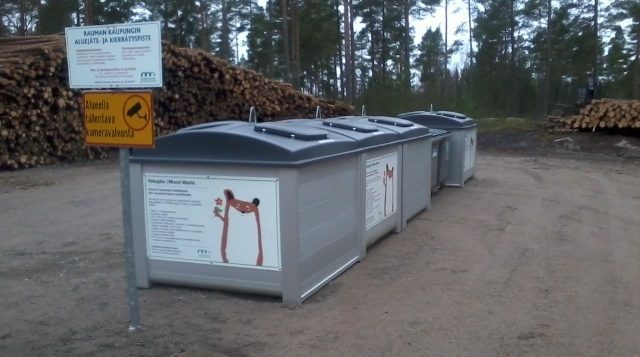 In the city of Rauma, there are several recycling points where it provides both complementary packaging waste and other recyclable waste collections. The cost of the points is covered by the waste fee. In some of these points there is also a battery compartment and the UFF and the Salvation Army collection containers. These points are intended specifically for the waste mentioned above. Don’t leave any other waste or large objects that do not fit into the collection container. Unfortunately, recycling points are also misused and cause additional cleaning and transportation costs, which are then covered by waste fees. This isn’t a good thing for the cleanliness of the environment and it is annoying to those who precisely and carefully sort and recycle their waste. Take the extra wastes from the renovating or moving, for example hazardous and electrical and electronic wastes to Hevossuo waste disposal site. On the Kierrätys.info website the recycling points are displayed on the map.